Week 15 of the 2014 NFL season opens up with the Arizona Cardinals clashing with the St. Louis Rams on “Thursday Night Football”. Time is running out to make a move in your office pool. Get a printable NFL Pick Em Week 15 sheet and get a leg up on the competition. Both the Cardinals and Rams put together solid 2013 seasons in the ultra-competitive NFC West. Arizona narrowly missed the playoffs with a record of 10-6, while the Rams finished with a respectable record of 7-9. The Rams opened the 2013 campaign with a 27-24 victory over the Cardinals, but Arizona got revenge with a 30-10 victory in the desert in Week 14. 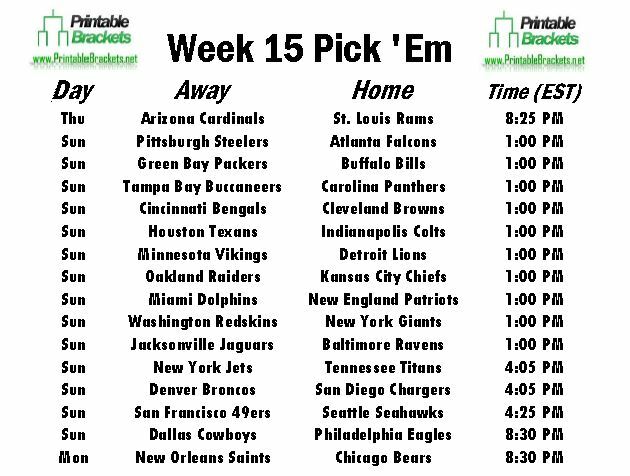 Meanwhile, there are a total of 10 early Sunday games on the Week 15 NFL pick em sheet. Divisional matchups rule the early slate, as the New York Giants will host the Washington Redskins, the Tampa Bay Buccaneers will take on the Carolina Panthers, the Cincinnati Bengals will battle the Cleveland Browns, the Houston Texans will collide with the Indianapolis Colts, and the Minnesota Vikings will meet the Detroit Lions. The late Sunday action on the Week 15 NFL pick em sheet is headlined by a meeting between two bitter NFC West rivals, as the defending Super Bowl champion Seattle Seahawks will host the San Francisco 49ers. Peyton Manning and the Denver Broncos will also be on the road to meet Philip Rivers and the San Diego Chargers. In Sunday’s nightcap, the division theme continues as the Nick Foles and the Philadelphia Eagles will face Tony Romo and the Dallas Cowboys on “Sunday Night Football”. The Week 15 schedule wraps up with Drew Brees and the New Orleans Saints heading to Chicago to battle Jay Cutler and the Bears on “Monday Night Football”.